The Nizam Jewelry Exhibition At Salarjung Museum is an event that took place between 24-Nov-2001 and 14-Feb-2002 in Hyderabad. can see but you can't touch". The collection of the late Nizam has a history as fabulous as the jewels themselves. And though the Government of India acquired the jewelry from the NJT on January 12, 1995, paying Rs 218 crore, it is said it is valued today at Rs 5,000 crore in the international market. 173 pieces of gold and diamond might not seem pathetically low, but these are still only a few of what were originally possessed by the Nizam, most of which are said to have been sold in other countries. Only a few of the well known pieces of jewelry, worn and documented through photographs, were made part of the Nizam Jewelry Trust (NJT), and it is these which were acquired by the government. The most fabulous among them is the Jacob diamond, which weighs 184.75 carats and is considered to be the seventh largest diamond in size. This was originally bought in London by a Jewish trader from Africa, who then brought this diamond to India and sold it to the sixth Nizam. "Almost all the articles have descended to the successive rulers from the founder of the dynasty and his son and successor, and have constituted the secret personal property of my predecessors,'' wrote the last Nizam Mir Osman Ali Khan to the government on June 4, 1949. The jewelry designing was influenced partly by Mughal designs and partly by those of the local artisans of the Asaf Jahi periods. Some of the designs and styles were British, while the others were heavy and chunky. 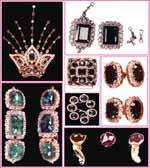 The official jewelers of the Nizams were P Orr, Madras, and Dinshaw Guzdar, Bombay. Incidentally it was Guzdar, the trusted appraiser of the Nizams, who also made an inventory of the jewelry of the seventh Nizam in the 1950s. The jewelry reflects the brilliance of the Golconda diamonds. Almost all of them had diamonds; some of them were uncut, while the others were cut into magnificent pieces by local artisans. What gives the diamonds a greater importance is that 99 per cent of them were mined from the Golconda Diamond Mines, the owners of the mines being the Nizams. Though little is known of the origin of many pieces, many are said to have been acquired by the first Nizam in the 1720s. Some were acquired from the Mughals, and the Nizams also bought a number of pieces from the collection of the Russian Czars. information, please contact A K V S Reddy, Director, SJM, at 452-3211/12. fullhyd.com has 700,000+ monthly visits. Tell Hyderabad what you feel about The Nizam Jewelry Exhibition At Salarjung Museum!